Sports Product Design graduate student Nick Cantrell and his hackathon team get advice from their masterclass mentors Rolf Günther (standing, right) and Nora Kühner (standing, second from right). What might athletes be wearing at the next Olympic Games? What makes a jacket design successful? What role does ergonomics play in sportswear design? 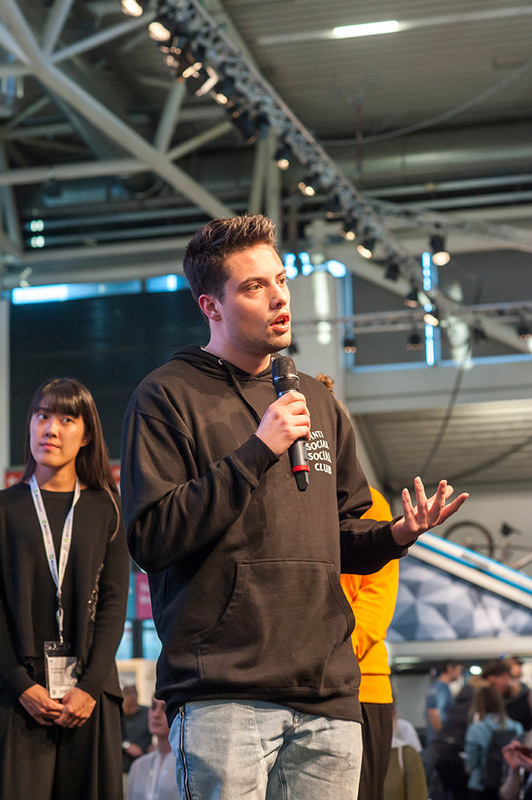 Two students from the School of Art + Design’s Sports Product Design graduate program in Portland got a chance to ponder questions like these and more in Munich, Germany, last month when they attended one of the world’s largest trade fairs for sporting goods and sports apparel, ISPO Munich. 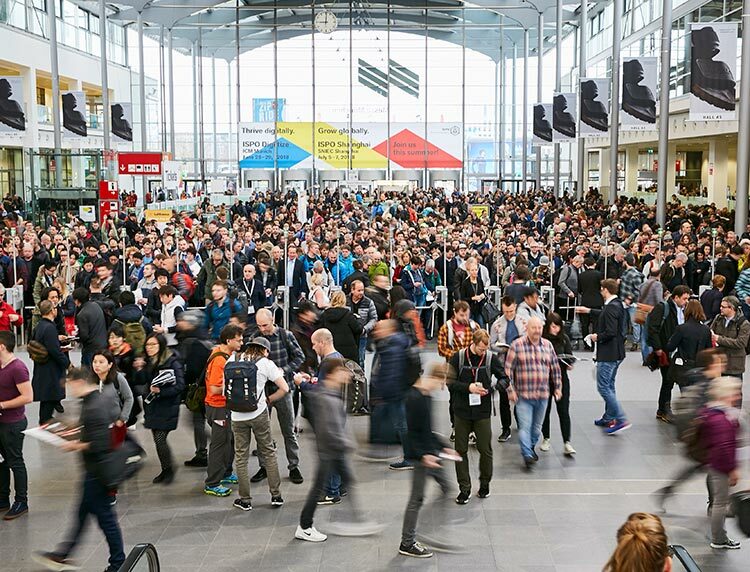 Drawing more than 84,000 visitors from 120 countries, ISPO brings designers, manufacturers, and retailers together to explore the latest products in segments of the sports industry such as snow sports, outdoor, health and fitness, and team sports. It also plays host to the ISPO Academy Masterclass. Held during the fair, the masterclass aims to foster talented new designers in a four-day program that emphasizes creative use of new materials, ergonomic properties, and technological improvements. Only nine schools were invited to participate in the masterclass this year, and the University of Oregon’s College of Design was among them. Nick Cantrell and Olivia Echols joined 25 other students from China, France, Austria, UK, Germany, Taiwan, Sweden, and Finland to participate in a variety of design challenges and presentations. “It’s such a great honor to have our new program in Sports Product Design and the students’ work recognized by the organizers of the ISPO Academy Masterclass,” says Susan Sokolowski, director of the Sports Product Design graduate program at the UO in Portland. 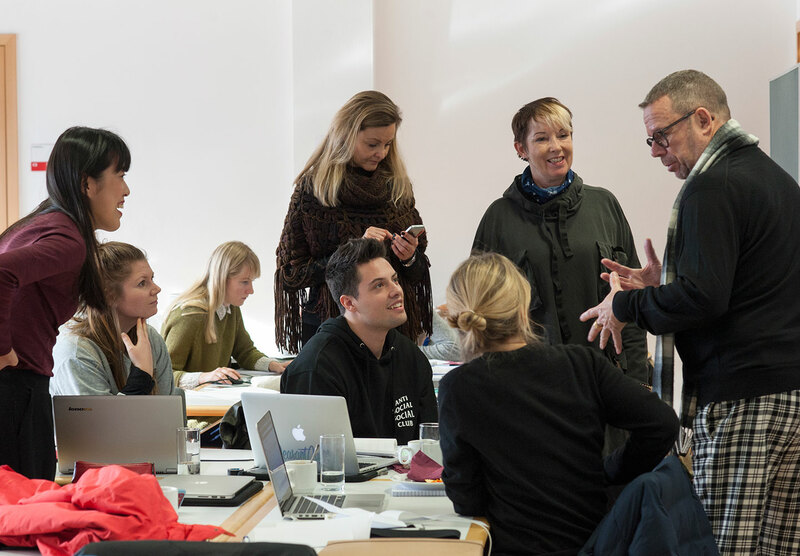 The masterclass mentors, international designers Nora Kühner and Rolf Günther, put students through their paces while teaching them about developing intelligent and innovative products for the sports industry. “They taught us about the significant differences between sports apparel and traditional fashion design, which trends are most relevant to future-forward developments in sports clothing, and the specific functional and ergonomic requirements for good design,” said Cantrell. SPD graduate student Olivia Echols (left) presents on the sustainability aspects of her team’s sports apparel project in Munich. The first two days involved a design ‘hackathon’ where students were split into six groups with a unique challenge to solve in just two days. They spent the following two days touring the show, attending lectures, and presenting their concepts to some of the show’s audience on the final day. “My group set out to tackle the challenge of adaptability from outdoor to urban environments. The class was focused on apparel innovation, so we created an adaptable system for the urban commuter. My team designed a jacket, a vest, and trousers to eliminate the need for a backpack.,” Cantrell explained. For Cantrell’s UO classmate Olivia Echols and her team, the hackathon challenge centered on how to provide consumers with a kit suited to a multisport lifestyle and environment. “We moved away from creating a product per se and created a digital platform to get consumers the kits they needed. For example, an athlete might run, kayak, and climb, so a selection of eight garments would appear in their cart. It’s all about buying fewer products that can be used across multiple sports,” said Echols. “We decided to have local sourcing and manufacturing and a return-and-repair policy for all of our garments because we also wanted to emphasize that sustainability was at the core of our brand concept,” she added. 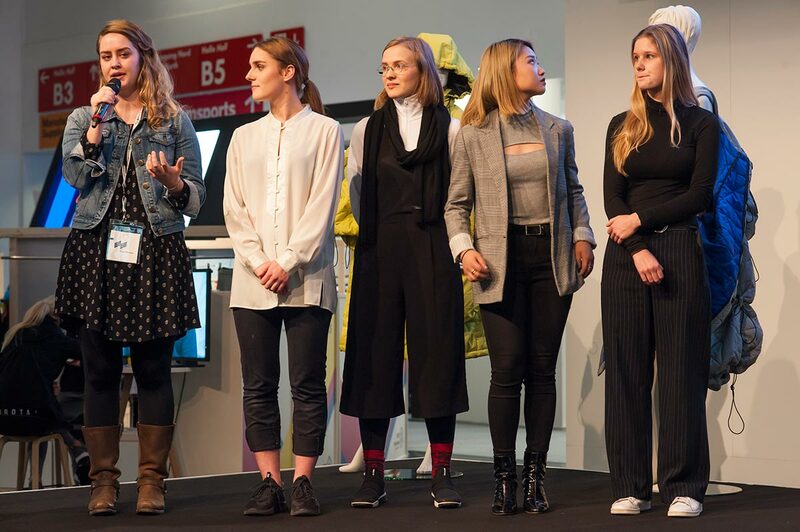 “For those who attended, their experience was transformative—they were a part of the world’s largest sports business trade fair, able to collaborate with international designers and receive critiques from industry experts as well as from peers around the globe” said Sokolowski. The students are already applying what they learned to their work back in Portland. “The experience at ISPO prepared us not only to participate in a global economy but also in a global industry, like sport product design. In the future, we will be working with people from all over the world, so the earlier we get exposed to people and experiences beyond our program and country, the better prepared we will be to work through design challenges with people from a wide variety of backgrounds and viewpoints, said Echols. For Cantrell, attending ISPO in Munich was the first time he’d been outside the US. “Experiencing new cultures and observing the differences in products and lifestyles helped me gain a more holistic view of how design is interpreted in another culture” Cantrell said. 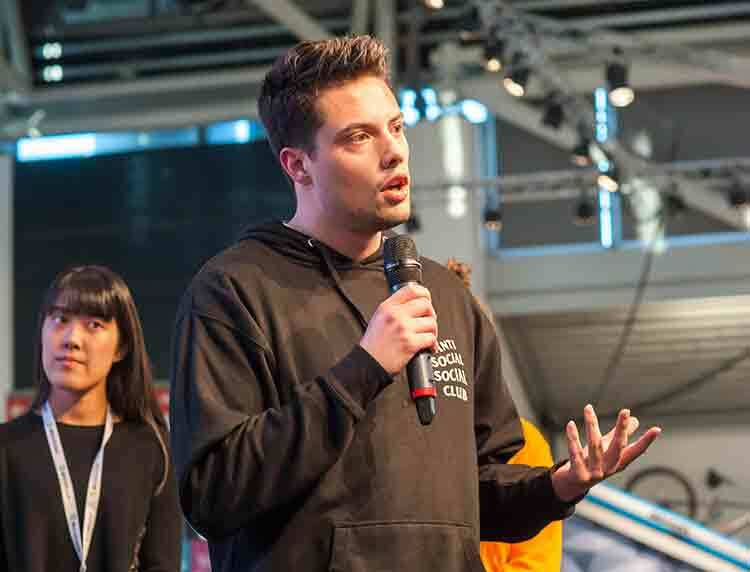 Nick Cantrell presents his “Eliminate the Backpack” project with his team at ISPO Munich. 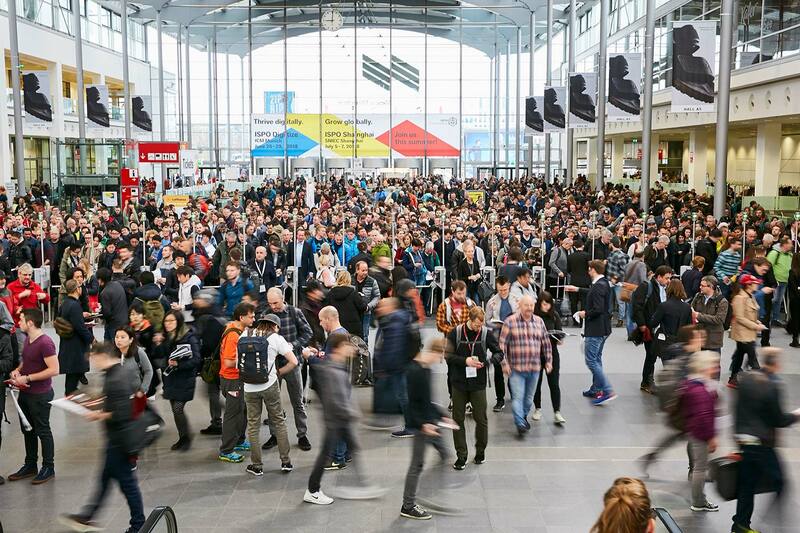 ISPO Munich is one of the world’s largest sports trade fairs.